The "Genesis Rock", returned by the Apollo 15 lunar mission in 1971. A sample-return mission is a spacecraft mission with the goal of collecting and returning samples from an extraterrestrial location to Earth for analysis. Sample-return missions may bring back merely atoms and molecules or a deposit of complex compounds such as loose material ("soil") and rocks. These samples may be obtained in a number of ways, such as soil and rock excavation or a collector array used for capturing particles of solar wind or cometary debris. A spacecraft is a vehicle or machine designed to fly in outer space. 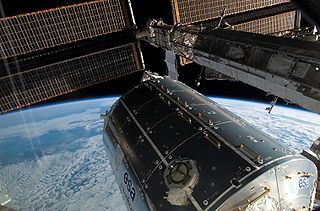 Spacecraft are used for a variety of purposes, including communications, earth observation, meteorology, navigation, space colonization, planetary exploration, and transportation of humans and cargo. All spacecraft except single-stage-to-orbit vehicles cannot get into space on their own, and require a launch vehicle. To date, samples of Moon rock from Earth's Moon have been collected by robotic and crewed missions, the comet Wild 2 and the asteroid 25143 Itokawa have been visited by a robotic spacecraft which returned samples to Earth, and samples of the solar wind have been returned by a robotic mission. Moon rock or lunar rock is rock that is found on the Earth's moon including lunar material collected during the course of human exploration of the Moon, or rock that has been ejected naturally from the Moon's surface. 25143 Itokawa (; Japanese: イトカワ,いとかわ,糸川 [itokaɰa]; provisional designation 1998 SF36) is a sub-kilometer near-Earth object of the Apollo group and a potentially hazardous asteroid. It was discovered by the LINEAR program in 1998 and later named after Japanese rocket engineer Hideo Itokawa. The strange peanut-shaped S-type asteroid has a rotation period of 12.1 hours and measures approximately 330 meters (1,100 feet) in diameter. Due to its low density and high porosity, Itokawa is considered to be a rubble pile, consisting of numerous boulders of different sizes rather than of a single solid body. In addition to sample-return missions, samples from three identified non-terrestrial bodies have been collected by means other than sample-return missions: samples from the Moon in the form of Lunar meteorites, samples from Mars in the form of Martian meteorites, and samples from Vesta in the form of HED meteorites. A lunar meteorite is a meteorite that is known to have originated on the Moon. A meteorite hitting the Moon is normally classified as a transient lunar phenomenon. Mars is the fourth planet from the Sun and the second-smallest planet in the Solar System after Mercury. 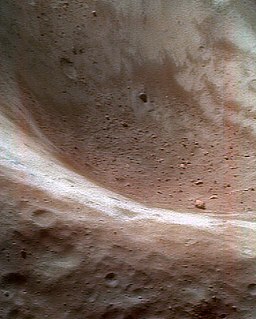 In English, Mars carries a name of the Roman god of war, and is often referred to as the "Red Planet" because the reddish iron oxide prevalent on its surface gives it a reddish appearance that is distinctive among the astronomical bodies visible to the naked eye. Mars is a terrestrial planet with a thin atmosphere, having surface features reminiscent both of the impact craters of the Moon and the valleys, deserts, and polar ice caps of Earth. A Martian meteorite is a rock that formed on the planet Mars and was then ejected from Mars by the impact of an asteroid or comet, and finally landed on the Earth. Of over 61,000 meteorites that have been found on Earth, 224 were identified as Martian as of January 2019. These meteorites are thought to be from Mars because they have elemental and isotopic compositions that are similar to rocks and atmosphere gases analyzed by spacecraft on Mars. In October 2013, NASA confirmed, based on analysis of argon in the Martian atmosphere by the Mars Curiosity rover, that certain meteorites found on Earth thought to be from Mars were indeed from Mars. Samples available on Earth can be analyzed in laboratories, so we can further our understanding and knowledge as part of the discovery and exploration of the Solar System. Until now many important scientific discoveries about the Solar System were made remotely with telescopes, and some Solar System bodies were visited by orbiting or even landing spacecraft with instruments capable of remote sensing or sample analysis. While such an investigation of the Solar System is technically easier than a sample-return mission, the scientific tools available on Earth to study such samples are far more advanced and diverse than those that can go on spacecraft. Analysis of samples on Earth allows to follow up any findings with different tools, including tools that have yet to be developed; in contrast, a spacecraft can carry only a limited set of analytic tools, and these have to be chosen and built long before launch. 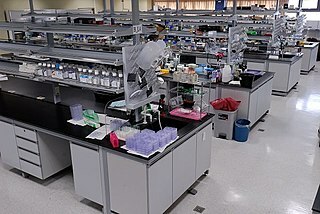 A laboratory is a facility that provides controlled conditions in which scientific or technological research, experiments, and measurement may be performed. Discovery and exploration of the Solar System is observation, visitation, and increase in knowledge and understanding of Earth's "cosmic neighborhood". This includes the Sun, Earth and the Moon, the major planets including Mercury, Venus, Mars, Jupiter, Saturn, Uranus, and Neptune, their satellites, as well as smaller bodies including comets, asteroids, and dust. The Solar System is the gravitationally bound planetary system of the Sun and the objects that orbit it, either directly or indirectly. Of the objects that orbit the Sun directly, the largest are the eight planets, with the remainder being smaller objects, such as the five dwarf planets and small Solar System bodies. Of the objects that orbit the Sun indirectly—the moons—two are larger than the smallest planet, Mercury. Samples analyzed on Earth can be matched against findings of remote sensing, for more insight into the processes that formed the Solar System. This was done, for example, with findings by the Dawn spacecraft, which visited the asteroid Vesta from 2011 to 2012 for imaging, and samples from HED meteorites (collected on Earth until then), which were compared to data gathered by Dawn. These meteorites could then be identified as material ejected from the large impact crater Rheasilvia on Vesta. This allowed deducing the composition of crust, mantle and core of Vesta. Similarly some differences in composition of asteroids (and, to a lesser extent, different compositions of comets) can be discerned by imaging alone. However, for a more precise inventory of the material on these different bodies, more samples will be collected and returned in the future, to match their compositions with the data gathered through telescopes and astronomical spectroscopy. Dawn is a retired space probe launched by NASA in September 2007 with the mission of studying two of the three known protoplanets of the asteroid belt, Vesta and Ceres. It was retired on 1 November 2018 and it is currently in an uncontrolled orbit around its second target, the dwarf planet Ceres. Dawn is the first spacecraft to orbit two extraterrestrial bodies, the first spacecraft to visit either Vesta or Ceres, and the first to visit a dwarf planet, arriving at Ceres in March 2015, a few months before New Horizons flew by Pluto in July 2015. HED meteorites are a clan (subgroup) of achondrite meteorites. HED stands for "howardite–eucrite–diogenite". These achondrites came from a differentiated parent body and experienced extensive igneous processing not much different from the magmatic rocks found on Earth and for this reason they closely resemble terrestrial igneous rocks. One further focus of such investigation—besides the basic composition and geologic history of the various Solar System bodies—is the presence of the building blocks of life on comets, asteroids, Mars or the moons of the gas giants. Several sample-return missions to asteroids and comets are currently in the works. More samples from asteroids and comets will help determine whether life formed in space and was carried to Earth by meteorites. Another question under investigation is whether extraterrestrial life formed on other Solar System bodies like Mars or on the moons of the gas giants, and whether life might even exist there. The result of NASA's last "Decadal Survey" was to prioritize a Mars sample-return mission, as Mars has a special importance: it is comparatively "nearby", might have harbored life in the past, and might even continue to sustain life. Jupiter's moon Europa is another important focus in the search for life in the Solar System. However, due to the distance and other constraints, Europa might not be the target of a sample-return mission in the foreseeable future. Historical geology or paleogeology is a discipline that uses the principles and techniques of geology to reconstruct and understand the geological history of Earth. It focuses on geologic processes that change the Earth's surface and subsurface; and the use of stratigraphy, structural geology and paleontology to tell the sequence of these events. It also focuses on the evolution of plants and animals during different time periods in the geological timescale. The discovery of radioactivity and the development of several radiometric dating techniques in the first half of the 20th century provided a means of deriving absolute versus relative ages of geologic history. In chemistry, an organic compound is generally any chemical compound that contains carbon. Due to carbon's ability to catenate, millions of organic compounds are known. Study of the properties and synthesis of organic compounds is the discipline known as organic chemistry. For historical reasons, a few classes of carbon-containing compounds, along with a handful of other exceptions, are not classified as organic compounds and are considered inorganic. No consensus exists among chemists on precisely which carbon-containing compounds are excluded, making the definition of an organic compound elusive. Although organic compounds make up only a small percentage of the Earth's crust, they are of central importance because all known life is based on organic compounds. Most synthetically produced organic compounds are ultimately derived from petrochemicals consisting mainly of hydrocarbons. A gas giant is a giant planet composed mainly of hydrogen and helium. Gas giants are sometimes known as failed stars because they contain the same basic elements as a star. Jupiter and Saturn are the gas giants of the Solar System. The term "gas giant" was originally synonymous with "giant planet", but in the 1990s it became known that Uranus and Neptune are really a distinct class of giant planet, being composed mainly of heavier volatile substances. For this reason, Uranus and Neptune are now often classified in the separate category of ice giants. 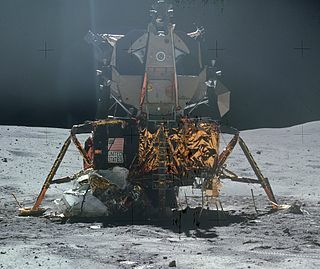 Apollo 11 was the first mission to return extraterrestrial samples. Moon rock from Apollo 15 interpretive sign. Moon rock from Apollo 15 at NASA Ames Visitor Center. The 1984 LDEF mission returned chondritic and iron-nickel impactors,  as did the 1992 EURECA mission. The Earth-Orbital Debris Collection (ODC) experiment was deployed on the Mir space station for 18 months during 1996–97 and used aerogel to capture particles from low Earth orbit, consisting of interplanetary dust and man-made particles. Far from being "the last sample-return mission... in... twenty years", ODC was a portable version of an LDEF collector, decreasing collection time significantly, and effective area by orders of magnitude. 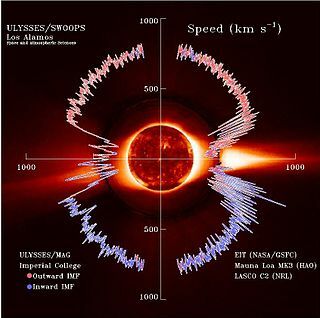 An artist's rendering of Genesis collecting solar wind. Ascent vehicle in its protective shroud, 2009 ESA-NASA design. China is planning to conduct a Chang'e 5 lunar sample return around 2019. If successful, it would mark the first lunar sample return in over 40 years. Russia has plans for Luna-Grunt mission to return samples from the Moon by 2021 and Mars-Grunt to return samples from Mars 5–10 years later. Also, Russia plans to repeat the Fobos-Grunt mission near 2024. A collector array may be used to collect millions or billions of atoms, molecules, and fine particulates by using a number of wafers made of different elements. The molecular structure of these wafers allows the collection of various sizes of particles. Collector arrays, such as those flown on Genesis, are ultra-pure in order to ensure maximal collection efficiency, durability, and analytical distinguishability. Collector arrays are useful for collecting tiny, fast-moving atoms such as those expelled by the Sun through the solar wind, but can also be used for collection of larger particles such as those found in the coma of a comet. The NASA spacecraft known as Stardust implemented this technique. However, due to the high speeds and size of the particles that make up the coma and the area nearby, a dense solid-state collector array was not viable. As a result, another means for collecting samples had to be designed as to preserve the safety of the spacecraft and the samples themselves. Aerogel is a silica-based porous solid with a sponge-like structure, 99.8% of whose volume is empty space. Aerogel has about 1/1000 of the density of glass. An aerogel was used in the Stardust spacecraft because the dust particles the spacecraft was to collect would have an impact speed of about 6 km/s. A collision with a dense solid at that speed could alter their chemical composition or perhaps vaporize them completely. Since the aerogel is mostly transparent, and the particles leave a carrot-shaped path once they penetrate the surface, scientists can easily find and retrieve them. Since its pores are on the nanometer scale, particles, even ones smaller than a grain of sand, do not merely pass through the aerogel completely. Instead, they slow to a stop and then are embedded within it. The Stardust spacecraft has a tennis-racket-shaped collector with aerogel fitted to it. The collector is retracted into its capsule for safe storage and delivery back to Earth. Aerogel is quite strong and easily survives both launching and outer-space environments. Some of the most risky and difficult types of sample-return missions are those that require landing on an extraterrestrial body such as an asteroid, moon, or planet. It takes a great deal of time, money, and technical ability in order to even initiate such plans. It is a difficult feat that requires that everything from launch to landing to retrieval and launch back to Earth is planned out with high precision and accuracy. Unmanned or uncrewedspacecraft are spacecraft without people on board, used for unmanned spaceflight. Uncrewed spacecraft may have varying levels of autonomy from human input; they may be remote controlled, remote guided or even autonomous, meaning they have a pre-programmed list of operations, which they will execute unless otherwise instructed. Many habitable spacecraft also have varying levels of robotic features. For example, the space stations Salyut 7 and Mir, and the ISS module Zarya were capable of remote guided station-keeping, and docking maneuvers with both resupply craft and new modules. The most common uncrewed spacecraft categories are robotic spacecraft, uncrewed resupply spacecraft, space probes and space observatories. Not every uncrewed spacecraft is a robotic spacecraft; for example, a reflector ball is a non-robotic uncrewed spacecraft. A lander is a spacecraft which descends toward and comes to rest on the surface of an astronomical body. By contrast with an impact probe, which makes a hard landing and is damaged or destroyed so ceases to function after reaching the surface, a lander makes a soft landing after which the probe remains functional. Stardust was a 390 kilogram robotic space probe launched by NASA on 7 February 1999. Its primary mission was to collect dust samples from the coma of comet Wild 2, as well as samples of cosmic dust, and return these to Earth for analysis. It was the first sample return mission of its kind. En route to comet Wild 2, the craft also flew by and studied the asteroid 5535 Annefrank. The primary mission was successfully completed on 15 January 2006, when the sample return capsule returned to Earth. NASA's Discovery Program is a series of lower-cost, highly focused American scientific space missions that are exploring the Solar System. It was founded in 1992 to implement then-NASA Administrator Daniel S. Goldin's vision of "faster, better, cheaper" planetary missions. Discovery missions differ from traditional NASA missions where targets and objectives are pre-specified. Instead, these cost-capped missions are proposed and led by a scientist called the Principal Investigator (PI). Proposing teams may include people from industry, small businesses, government laboratories, and universities. Proposals are selected through a competitive peer review process. All of the completed Discovery missions are accomplishing ground-breaking science and adding significantly to the body of knowledge about the Solar System. Hayabusa was a robotic spacecraft developed by the Japan Aerospace Exploration Agency (JAXA) to return a sample of material from a small near-Earth asteroid named 25143 Itokawa to Earth for further analysis. Hayabusa, formerly known as MUSES-C for Mu Space Engineering Spacecraft C, was launched on 9 May 2003 and rendezvoused with Itokawa in mid-September 2005. After arriving at Itokawa, Hayabusa studied the asteroid's shape, spin, topography, colour, composition, density, and history. In November 2005, it landed on the asteroid and collected samples in the form of tiny grains of asteroidal material, which were returned to Earth aboard the spacecraft on 13 June 2010. The Lunar and Planetary Institute (LPI) is a scientific research institute dedicated to study of the solar system, its formation, evolution, and current state. The Institute is part of the Universities Space Research Association (USRA) and is supported by the Science Mission Directorate of the National Aeronautics and Space Administration (NASA). Located at 3600 Bay Area Boulevard in Houston, Texas, the LPI maintains an extensive collection of lunar and planetary data, carries out education and public outreach programs, and offers meeting coordination and publishing services. The LPI sponsors and organizes several workshops and conferences throughout the year, including the Lunar and Planetary Science Conference (LPSC) held in March in the Houston area. A space probe is a robotic spacecraft that does not orbit Earth, but instead, explores further into outer space. A space probe may approach the Moon; travel through interplanetary space; flyby, orbit, or land on other planetary bodies; or enter interstellar space. Hayabusa Mk2 was a proposed Japan Aerospace Exploration Agency (JAXA) space mission aimed at visiting a small primitive asteroid and returning a sample to Earth for laboratory analysis. It was intended to be the follow-on mission to JAXA's Hayabusa mission, as well as the Hayabusa 2 mission. The latest proposal for Hayabusa Mk2 stated its target to be the dormant comet 4015 Wilson–Harrington, with a launch of the probe in 2018. From 2007 to 2010, it was also considered as a joint JAXA-ESA mission under the name Marco Polo. The in-situ investigation and sample analysis would allow scientists to improve our knowledge of the physical and chemical properties of a small Near-Earth Object (NEO) which is thought to have kept the original composition of the solar nebula in which planet formed. Thus, it would provide some constraints to the models of planet formation and some information on how life may have been brought to Earth. Information on the physical structure will help defining efficient mitigation strategies against a potential threatening object. The Near-Earth Asteroid Scout is a planned mission by NASA to develop a controllable low-cost CubeSat solar sail spacecraft capable of encountering near-Earth asteroids (NEA). The NEA Scout will be one of 13 CubeSats to be carried with the Orion EM-1 mission into a heliocentric orbit in cis-lunar space on the maiden flight of the Space Launch System (SLS) scheduled to launch in 2020. The most likely target for the mission is 1991 VG, but this may change based on launch date or other factors. After deployment in cislunar space, NEA Scout will perform a series of lunar flybys to achieve optimum departure trajectory before beginning its two-year-long cruise. DESTINY+ (Demonstration and Experiment of Space Technology for INterplanetary voYage Phaethon fLyby dUSt science) is a planned mission to flyby the meteor shower parent body 3200 Phaethon, as well as various minor bodies originating from the "rock comet". The spacecraft is being developed by the Japanese space agency JAXA, and will demonstrate advanced technologies for future deep space exploration. As of 2017, DESTINY+ is planned to be launched in 2022. EQUULEUS is a nanosatellite of the 6-Unit CubeSat format that will measure the distribution of plasma that surrounds the Earth (plasmasphere) to help scientists understand the radiation environment in that region. It will also demonstrate low-thrust trajectory control techniques, such as multiple lunar flybys, within the Earth-Moon region using water steam as propellant. The spacecraft was designed and developed jointly by the Japan Aerospace Exploration Agency (JAXA) and the University of Tokyo. The Martian Moons Exploration (MMX) is a robotic space probe set for launch in 2024 to bring back the first samples from Mars' largest moon Phobos. Developed by the Japanese Aerospace Exploration Agency (JAXA) and announced in 9 June 2015, MMX will land and collect samples from Phobos once or twice, along with conducting Deimos flyby observations and monitoring Mars' climate. CAESAR is a proposed sample-return mission to comet 67P/Churyumov–Gerasimenko. The mission was proposed in 2017 to NASA's New Frontiers program mission 4, and on 20 December 2017 it was one of two finalists selected for further concept development. The Extraterrestrial Sample Curation Center (ESCuC) is the facility where Japan Aerospace Exploration Agency (JAXA) conducts the curation works of extraterrestrial materials retrieved by some sample-return missions. They work closely with Japan's Astromaterials Science Research Group. Its objectives include documentation, preservation, preparation, and distribution of samples. All samples collected are made available for international distribution upon request. The curation of extraterrestrial samples (astromaterials) obtained by sample-return missions take place at facilities specially designed to preserve both the sample integrity and protect the Earth. Astromaterials are classified as either non-restricted or restricted, depending on the nature of the Solar System body. Non-restricted samples include the Moon, asteroids, comets, solar particles and space dust. Restricted bodies include planets or moons suspected to have either past or present habitable environments to microscopic life, and therefore must be treated as extremely biohazardous. ↑ What did Dawn learn at Vesta? The Planetary Society. 1 2 Joshua Lederberg Parasites Face a Perpetual Dilemma (PDF). Volume 65, Number 2, 1999 / American Society for Microbiology News 77. ↑ Assessment of Planetary Protection Requirements for Mars Sample Return Missions (Report). National Research Council. 2009. ↑ Preliminary Planning for an International Mars Sample Return Mission Report of the International Mars Architecture for the Return of Samples (iMARS) Working Group June 1, 2008. ↑ European Science Foundation – Mars Sample Return backward contamination – Strategic advice and requirements Archived 2016-06-02 at the Wayback Machine July, 2012, ISBN 978-2-918428-67-1 – see Back Planetary Protection section. (for more details of the document see abstract). ↑ Mars Sample Return: Issues and Recommendations. Task Group on Issues in Sample Return. National Academies Press, Washington, DC (1997). ↑ Orloff 2004, "Extravehicular Activity"
↑ Chaikin, Andrew (2007). A Man On the Moon: The Voyages of the Apollo Astronauts (Third ed.). New York: Penguin Books. pp. 611–613. ↑ Kristen Erickson (July 16, 2009). Amiko Kauderer, ed. 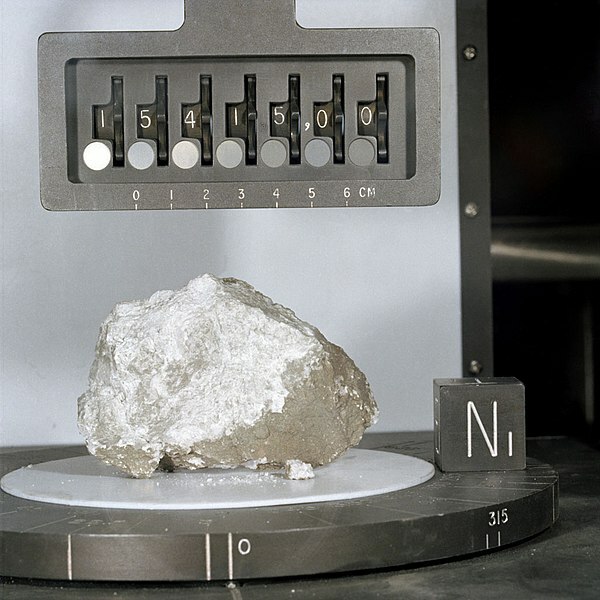 "Rock Solid: JSC's Lunar Sample Lab Turns 30". 40th Anniversary of Apollo Program. NASA. Retrieved June 29, 2012. 1 2 Wade, Mark. "Luna Ye-8-5". Encyclopedia Astronautica. Retrieved 27 July 2010. ↑ Hodges, P. (1961). "Sampling Dust from the Stratosphere". Smithsonian Contributions to Astrophysics. 5 (10): 145–152. Bibcode:1961SCoA....5..145H. doi:10.5479/si.00810231.5-10.145. ↑ Warren, J.; Zolensky, M. (1994). "Collection and curation of interplanetary dust particles recovered from the stratosphere". AIP Conference Proceedings. 310: 245–254. doi:10.1063/1.46514. ↑ Testa, J. (1990). "Collection of microparticles at high balloon altitudes in the stratosphere". Earth and Planetary Science Letters. 98 (3–4): 287–302. Bibcode:1990E&PSL..98..287T. doi:10.1016/0012-821X(90)90031-R.
↑ Oliver, J. art al. (1995). "LDEF Interplanetary Dust Experiment (IDE) results". Long Duration Exposure Flight (LDEF) Symposium. ↑ Westphal, A.; Stroud, R.; et al. (15 Aug 2014). "Evidence for interstellar origin of seven dust particles collected by the Stardust spacecraft". Science. 345 (6198): 786–91. Bibcode:2014Sci...345..786W. doi:10.1126/science.1252496. PMID 25124433. ↑ Amos, Jonathan (November 16, 2010). "Japan probe collected particles from Itokawa asteroid". BBC News . Retrieved November 16, 2010. ↑ Emily Lakdawalla (January 13, 2012). "Bruce Betts: Reflections on Phobos LIFE". The Planetary Society Blog. Retrieved March 17, 2012. ↑ Kramer, Andrew (January 15, 2012). "Russia's Failed Mars Probe Crashes Into Pacific" . Retrieved January 16, 2012. ↑ "Japanese spacecraft reaches asteroid after three-and-a-half-year journey – Spaceflight Now". spaceflightnow.com. Retrieved 2018-09-23. ↑ "Operation Status for the Asteroid Explorer Hayabusa2, in the vicinity of Ryugu" (PDF). global.jaxa.jp. 19 July 2018. Retrieved 22 September 2018. ↑ "NASA's OSIRIS-REx Speeds Toward Asteroid Rendezvous". NASA. 9 September 2016. Retrieved 9 September 2016. ↑ "Asteroid probe begins seven-year quest". BBC News. 9 September 2016. Retrieved 9 September 2016. ↑ "NASA To Launch New Science Mission To Asteroid In 2016". NASA. ↑ Hille, Karl (2018-11-16). "OSIRIS-REx is Prepared to TAG an Asteroid". NASA. Retrieved 2018-12-15. ↑ "Martian Moons eXploration (MMX) Mission Overview" (PDF). JAXA Tokyo Office: JAXA. 10 April 2017. Retrieved 2018-07-20. ↑ "火星衛星の砂回収へ　ＪＡＸＡ「フォボス」に探査機". Nikkei (in Japanese). September 22, 2017. Retrieved 2018-07-20. ↑ Visions and Voyages for Planetary Science in the Decade 2013–2022, National Academies Press. ↑ English.news.cn (2012-10-10). "China considers more Mars probes before 2030". news.xinhuanet.com. Retrieved 2012-10-14. ↑ Staff Writers Beijing (AFP) (2012-10-10). "China to collect samples from Mars by 2030: Xinhua". marsdaily.com. Retrieved 2012-10-14. ↑ China's Deep-space Exploration to 2030 by Zou Yongliao Li Wei Ouyang Ziyuan Key Laboratory of Lunar and Deep Space Exploration, National Astronomical Observatories, Chinese Academy of Sciences, Beijing. ↑ "Comet Surface Sample Return" (PDF). Lunar and Planetary Institute. Retrieved 8 January 2019. ↑ Finalists in NASA’s Spacecraft Sweepstakes: A Drone on Titan, and a Comet-Chaser. Kenneth Chang, The New York Times. 20 November 2017. ↑ "Stardust, NASA's Comet Sample Return Mission". NASA. Retrieved 11 December 2015. ↑ "Mir Orbital Debris Collector Data Analyzed". Spacedaily.com. Retrieved 8 July 2018. ↑ "NASA - Astrobiology Exposure and Micrometeoroid Capture Experiments". www.nasa.gov. Mars Exploration: Sample Returns Jet Propulsion Laboratory Mars Exploration Program on sample return missions. Stardust Homepage Jet Propulsion Laboratory Stardust mission website. Genesis Mission Homepage Jet Propulsion Laboratory Genesis mission website. Stardust: Aerogel Stardust website on aerogel technology. JAXA Hayabusa JAXA Hayabusa project update. MarsNews.com: Mars Sample Return MarsNews.com on Mars Sample Return missions. Texas Space Grant Consortium: Missions to the Moon A list of missions to the Moon from 1958 to 1998.